One Liner GK Current Affairs - 5th April 2018 has all the important headlines given in single sentences. At the end of the article we have given some Static GK and Note Down Points which are very important for the upcoming examinations of SSC, Bank and Rail so we hope candidates will go through them in details. 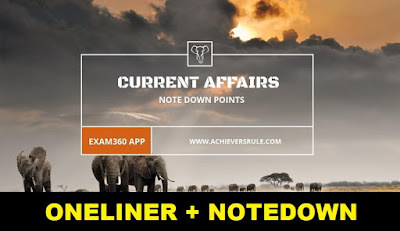 Moreover, we are also providing a Daily Current Affairs Quiz based on the Latest and Current Pattern which are also very helpful if you want to check you preparation. Aspirants can also go through the Daily Current Affairs Updates for today. Jio started its operations as a payments bank as Jio Payments Bank Limited . Private sector lender IndusInd Bank received RBI's approval to buy the securities services arm of IL&FS. According to Steel Users Federation of India (SUFI), India has overtaken Japan to become world’s second largest producer of crude steel in February 2018. The Union Cabinet approved amendments to the human rights protection bill for "better protection and promotion of human rights in the country. Russian President Vladimir Putin and Turkish President Tayyip Erdogan attended via videolink from Ankara a ceremony to mark the pouring of first concrete for unit 1 of the Akkuyu nuclear power plant. The Union Cabinet has been apprised of Memorandum of Understanding (MoU) signed between India and Canada to foster cross-border partnerships focused on research excellence and industry-academic collaboration. External Affairs Minister (EAM) Sushma Swaraj embarked a three-day official visit to Azerbaijan's capital city Baku to participate in Non-Aligned Movement (NAM) Ministerial Conference. Weight Lifter P. Gururaja Wins Silver at the Gold Coast Commonwealth Games 2018, in Australia.